With dipping pens, nibs, and ink, freelance illustrator Peter Fong brings South Australia's flora and fauna (both current and prehistoric) to life on parchment. Peter Fong has worked from The Mill since it opened in 2013. Until recent renovations, he had arguably the loveliest-looking studio: all raw wood and artificial vines, strung up like bunting at a party for one. 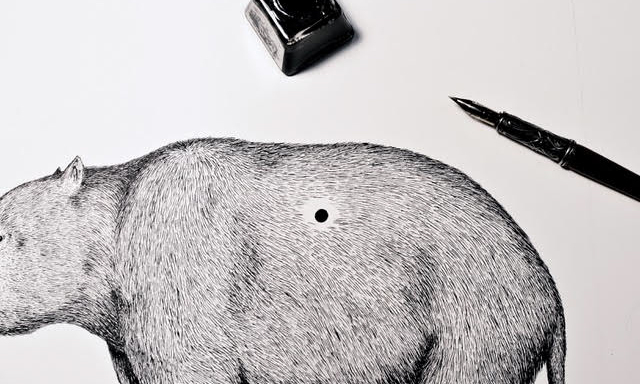 Being a freelance illustrator, Peter’s space also features his pen-and-ink designs. There’s a bounty of plant and animal works-in-progress to be found; each handcrafted over hours, even days, of intense focus. His style is old-fashioned in the way that – thanks to climate change and digital omnipotence – is also very now. Annual application for residencies open in June. See www.themilladelaide.com for more details. “Botanicals are really in,” says Peter, whose work on wine labels, wedding invitations and way-finding signage often features plants, leaves, flowers and the like. “When I draw, I look for textures. Say, if I wanna draw a flower, I look at the petals and see what I can work with. Even with small insects and bugs, there’s so much detail,” he says. Wielding old nibs, dipping pens and ink, Peter lives for texture. 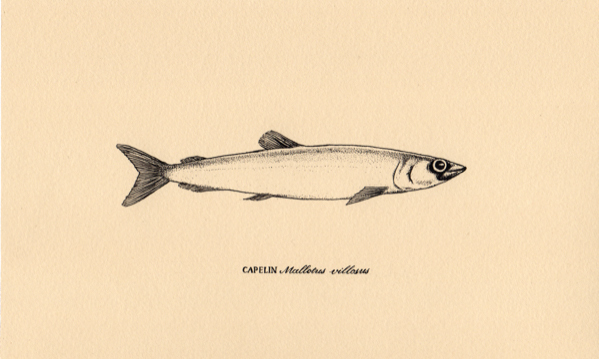 He brings mushrooms, budgies and mussels to life on parchment, using only solid lines, dots and cross-hatching. Rarely one for colour, Peter’s work is all black and white – or rather, black and lack. That’s necessity, he reckons, since he was never very good at colouring or painting (his words). The payoff is that printing mono-colour is comparatively cheap. “I’ve been getting heaps into calligraphy as well,” he says. “Old explorers used to do really nice calligraphy, so it suits my scientific drawings.” Taking a leaf from the books of botanists, zoologists and cartographers, Peter recently brought his yesteryear aesthetic to one curious collaboration, with the Department of Environment, Water and Natural Resources. They commissioned Peter to refresh signage in the Naracoorte Caves National Park. South Australia’s only World Heritage site, Naracoorte is peppered with pitfall traps and clammy caves. It houses a unique fossil record that tells palaeontological tales some 500,000 years old, dating back several ice ages. During that era – the Pleistocene – the land now known as Mount Gambier was frequented by giant marsupial ‘pouch lions’, bipedal kangaroos that strolled around like primates, and proto-wombats as big as your sister’s first hatchback. Australia’s megafauna expired roughly 60,000 years ago. In 2017, the government asked Peter to draw them. “It was pretty hard because nobody really knows [what they looked like]. It’s pretty subjective,” he says. To revivify the megafauna, Peter teamed up with scientific experts eking ancient history from the skeletal remains. “It’s all based on bones,” he says. “Like dinosaurs, we don’t know if they were scaly, so we try to trace it back through modern day animals. 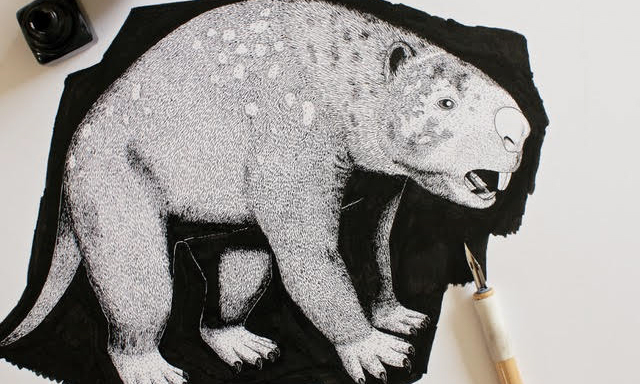 Zygomaturus is like a giant wombat, so it kind of looks like that,” he explains. Tuna’s having none of it, apparently, so it’s back to the drawing board.